Archipsocus nomas Gurney is a communal web-spinning barklouse. 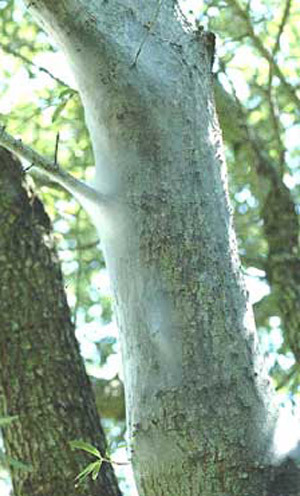 During some years they make extensive silken webs that often cover the trunks and branches of trees in the southeastern U.S. 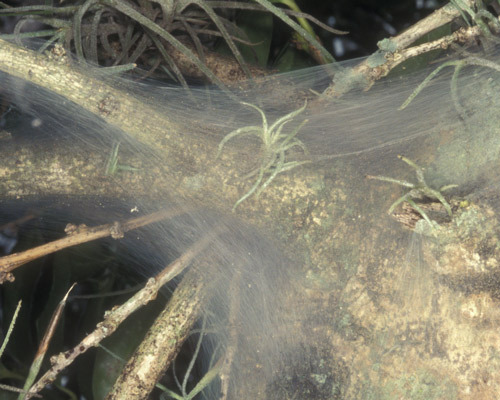 The webs are believed to protect the barklice from predators. The webs are unsightly, but neither the barklice nor the webs cause any harm to the trees. These insects are sometimes referred to as "tree cattle." Webbing barklice are found along the Gulf coast from Texas to Florida and along the Atlantic coast north to South Carolina. The eggs of Archipsocus nomas are oblong and wider at one end and gray or white in color. Nymphs and adults are soft-bodied insects with chewing mouthparts and long filamentous antennae. They lack cerci. First instar nymphs have eight antennal segments, but the full complement of 13 segments is gained at the first molt. The number of nymphal instars has not been determined for Archipsocus nomas. In Archipsocus floridanus, a closely related species, females have six, and males may have from four to six – but most commonly five. 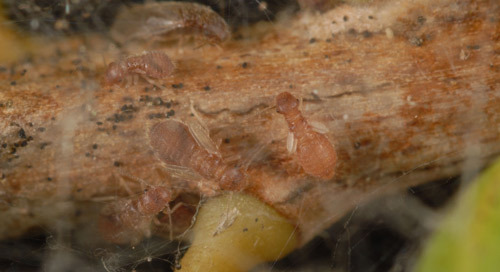 Adults are darker in color than nymphs. When winged, the wings are membranous and held roof-like over the body. Winged females may be either long or short winged. Winged males are short winged. Figure 1. Young Archipsocus sp. nymphs. Photograph by Lyle J.Buss, University of Florida. Figure 2. Late instar Archipsocus sp. nymphs. Photograph by Lyle J.Buss, University of Florida. Figure 3. Archipsocus sp. winged females. Photograph by Lyle J.Buss, University of Florida. Colonies of Archipsocus nomas are rare during the winter (December-February in central Florida) and are concentrated in live oak (Quercus virginiana Mill.) hammocks and stands of cabbage palms (Sabal palmetto [Walter]) where they probably are best sheltered from killing frosts. 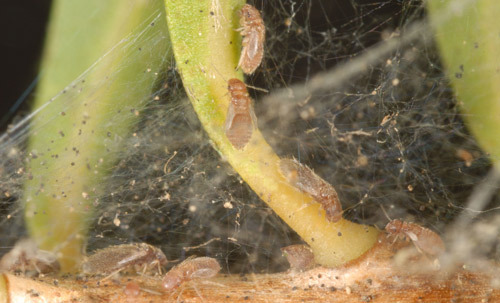 During this time, colonies are composed primarily of adults with a few late instar nymphs. 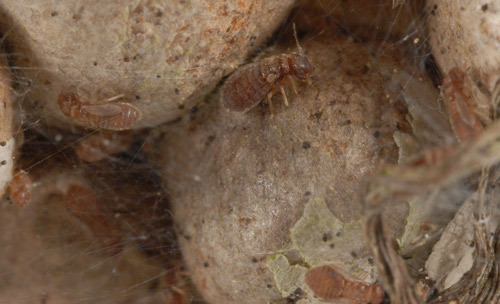 In the spring, eggs are laid singly or in groups and covered with debris or sometimes by feces. From March to June, colonies become more frequent, and from July to October, colonies rapidly increase in both number and size. The long-winged females are usually observed only during this time of maximum colony proliferation. Nymphs and adults probably feed primarily on lichens. By early December, populations have been greatly reduced by frost, and the webs begin to disintegrate due to weathering. Because the barklice are not harmful, control measures are not recommended. Figure 4. Archipsocus nomas Gurney silken web on Ilex sp. Photograph by D.W. Hall, University of Florida. Figure 5. Tree trunk covered in webbing produced by Archipsocus nomas Gurney. Photograph by Douglas L. Caldwell, University of Florida. Mockford EL. 1953. Three new species of Archipsocus from Florida (Psocoptera: Archipsocidae). Florida Entomologist 26: 113-124. Mockford EL. 1957. Life history studies on some Florida insects of the genus Archipsocus (Psocoptera). Bulletin of the Florida State Museum (Biological Sciences) University of Florida, Gainesville. 1: 253-274. Mockford EL. 1987. Order Psocoptera. In: Stehr FW, ed., Immature Insects. (Vol. 1) Kendall/Hunt Publishing Company, Dubuque, Iowa. pp. 196-214. Publication Date: October 2002. Latest revision: March 2016. Reviewed: February 2019.